Like textbooks, graphing calculators are still a necessary (and expensive) accessory for math and science students in high school and college. Sure, there are calculator apps for tablets and smartphones, but those are often banned for tests because they could let you cheat online. So, many students have to buy them, and the dominant models from Texas Instruments and Casio can be complex and expensive. Now, an open-source calculator called Numworks is taking them on with a clean, simple look, an intuitive interface and open source programming and design. 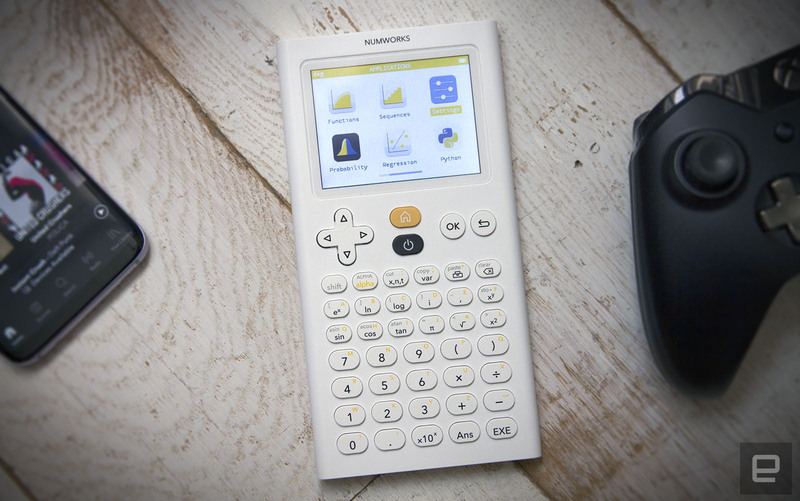 "It seems crazy to say this, but it's the only calculator on the market conceived for people of the 21st century," the creator and head of Numworks, Romain Goyet, tells Engadget. As such, the team steered clear of existing calculators, and instead looked at game consoles, smartphones and other modern devices for inspiration. 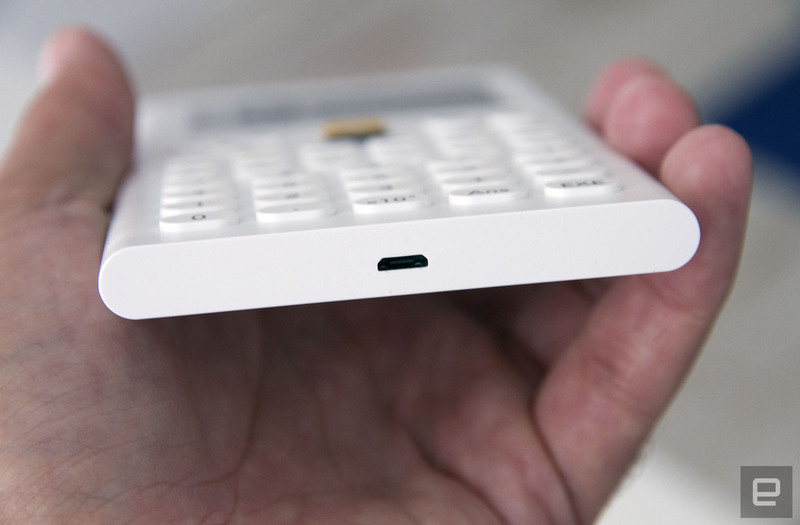 Physically, Numworks is much smaller than most scientific calculators, weighing just 5.9 ounces with a thickness of 10 millimeters (0.4 inches). It's rechargeable via a micro USB port (a cable, but not a charger, is included), and can go 20 hours between charges under normal operation. When not in use, it can hold a charge for "years" in deep sleep mode. The 2.8-inch diagonal (2.2 x 1.7 inch) screen can display over 262,000 colors. Goyet says he and Paris-based industrial designer Alexandre Morronoz wanted a clean, Apple-like design. They succeeded in that regard -- the look is about as far from the nerdcore models of TI and Casio as you can get. That choice is deliberate, so as not to distract from its main purpose, says Goyet. "We deliberately avoided complexity in order to make something simple and logical that students will want to use," he says. The keyboard is split into three distinct areas: navigation, advanced calculations and a numeric keypad with widely spaced keys to reduce entry errors. There's also a home, back, and standard On/Off button. There's no touchscreen, as with the pricey Casio FX-CP400 and similar models. Rather, navigation is done with arrow keys placed on the left of the device, opposite to most other graphing calculators. That's not an accident: It's designed to match the position of the navigation keys on gamepads. "We examined controllers from Sony and others to compare the layouts, buttons, etc. to see what made them efficient," Goyet explains. There are six applications to choose from: calculations, functions, sequences, statistics, probability and regression. (There's also a Python interpreter that's in beta.) Calculations are entered much as you'd see on paper, using numbers, operators and brackets, followed by "Exe" to get the answer. Students learning chalkboard algebraic notation will be at ease: If you tap 8π(25+6), for instance, it knows you mean 8*π*(25+6). Functions are entered the same way, and let you see a graph and table of possible solutions (x, y and other variables are entered by selecting the "alpha" key first). The same logic is used for statistics, regression and other calculations. The suite of applications was developed in collaboration with teachers and professors to cover all of a student's needs for high school and early college math and science. The other main idea behind Numworks is the transparency and open source nature of the design. "When you use an iPad, you don't really know how it works or what's inside. We publish all our plans," says Goyet. "How we do the plastic pieces, how we make the electronic circuits, how we write the software." Studying those plans and manuals could help students gain an understanding of coding and electronics, for one thing. But it also means that the product is expandable in the future. For instance, Goyet's team added the aforementioned Python interpreter so that students can learn or test code. Teachers and others can also contribute to the project, and see their work or suggestions arrive to all via updates (contributions are made here at Github). Right now, the calculator is a bit too basic for advanced math classes, Goyet says, but that could change down the road with the addition of new functions. You could even update your own, individual calculator if you're ambitious, as Numworks uses a standard flashing protocol (DFU) and the SDK is public. It's been a long while since I used a scientific calculator, but navigation feels similar to using a console controller, which may be a comfort to students that have gamed since they were tots. Despite my rustiness, I was able to quickly figure out how to enter calculations, create functions and make graphs. 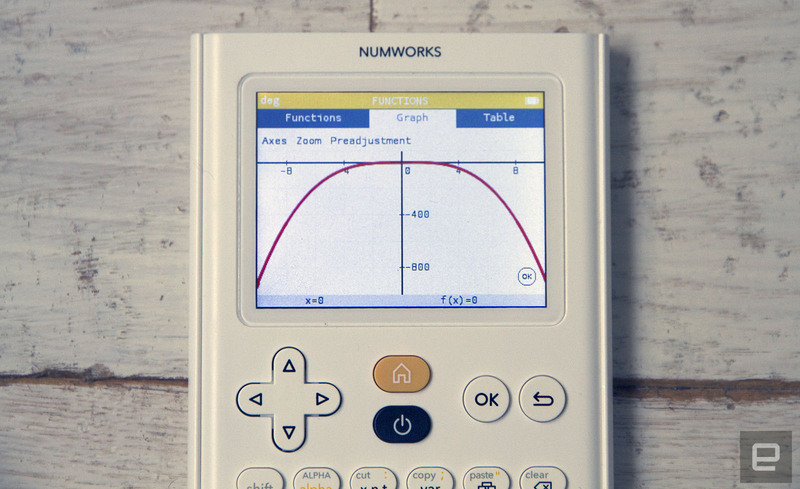 Calculator purists who like the funky style of devices like the Texas Instruments TI-84 may decry Numworks' minimalism, but the company doesn't really care about that. Rather, it's hoping that high-schoolers who have never not used smartphones, tablets and consoles will grasp it quickly and be able to focus on math, not learn a calculator. "If you give students something that's 25 years old, it's going to seem complicated to them," says Goyet. "So, it was simply made for the tastes of today." Numworks is available starting August 29th at Amazon and Numworks' website, for $100 in the US, £80 in the UK and $80 in Europe.